Disobedient Object is gathering together tools of protest from around the world. On display were instruments of direct action from a wide variety of political protests that have taken place since the 1970s. 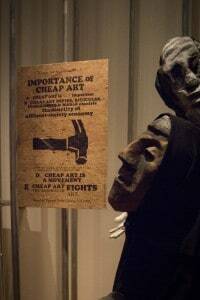 The piece that will stick in my mind was John Joe “Ash” Amador’s death mask, it was haunting. The mask was part of Carrie Reichardt’s ‘Tiki Love Truck’ which was driven through the streets of Manchester to protest about the death penalty. 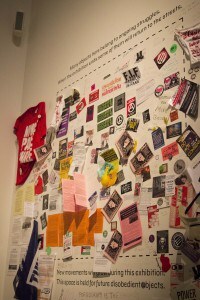 There was also a corner of the exhibition where people could right their own messages of protest. What I saw at Disobedient Objects followed on well from A World To Win. Poster of Protest and Revolution, and the Prix Pictet Prize for Photography and Sustainability ‘Consumption‘, two exhibitions that I’d seen at the V&A over the summer. I left with three main thoughts. Firstly this was a ground breaking exhibition. Secondly, awareness of art and design as a means of communication is on the rise. And finally, as a result of this awareness , art and design will continue to be a vehicle for political comment.